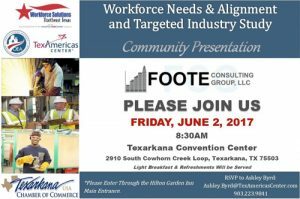 Workforce Solutions Northeast Texas and TexAmericas Center invite you to attend a Community Presentation by Foote Consulting Group (FCG) on Friday, June 2nd at the Texarkana Convention Center. The presentation will begin promptly at 8:30AM. Please arrive 10-15 minutes prior to the start time to enjoy a light breakfast and coffee service. Deane Foote, Jack Allston, and Teresa Nortillo with Foote Consulting Group will present on results from the Workforce Needs and Alignment and Targeted Industry Study they have been conducting as part of the Department of Defense (DOD) Office of Economic Adjustment (OEA) Industry Adjustment Grant. Since late February of this year, FCG has been working to conduct personal interviews with local major employers, officials, education administration– both within K-12 and Higher Education, and utility partners throughout the greater Texarkana region. The consultants will be presenting on which industries are best fits for the greater Texarkana region to help market business growth and expansion, as well as helping to identify bottleneck workforce issues and bring alignment to area training resources for meeting employee and employer needs.